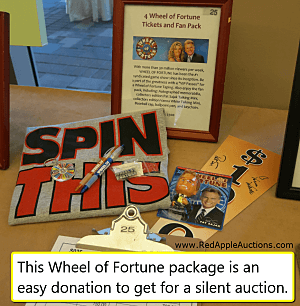 If you’re searching for some silent auction item ideas, one near guarantee donation is Wheel of Fortune. The game show is exceedingly generous in their donations. I shared the show’s donation information with a Miami, FL, client a few years ago. The nonprofit has received one or two fan packs for every auction since then. The package changes a bit every year, but the show often sends a kit like the one I’ve shown you in photograph. Plus, you get four tickets to a show. And if you’re less interested in a donation and would just like to be in the studio audience, here’s some information. It’s not live auction quality for most groups, but it’s a nice silent auction item. 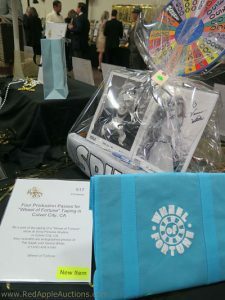 Ready for more help with your silent auction? 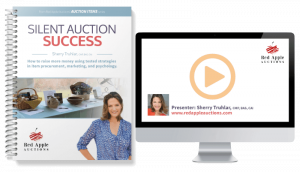 One of my best-selling programs is Silent Auction Marketing Savvy. It’s where you learn how to raise more cash in your silent auction, as soon as tonight! Whereas most silent auctions in the USA earn 50-65% returns, a number of my clients are earning $1 for every $1 donated … that’s unheard of. You, too, can join the ranks of these top performing auctions as you begin to make the changes I preach in this substantial course. Order it today, watch it with your committee (or hoard the information yourself), and see how your silent auction revenue can grow through simple changes. Here’s a photo of a Wheel of Fortune display from a March 2017 auction. 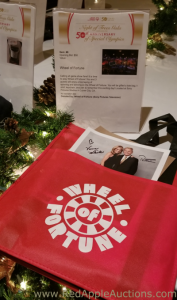 Here are two photos from a Wheel of Fortune display from a December 2018 auction. Hi Sherry – we just received our Wheel of Fortune items – thanks for letting us know about this! Quick question, where did you start your bidding at on this item? Gosh, that was taken a few years ago now … I really don’t remember. Even so, the starting bid is going to depend on the type of auction, length of bidding time, and crowd. I have identical items starting at $30 at some auctions and $90 at others; you got to know your crowd. Thanks – that helps a lot! Again thanks for the tip. 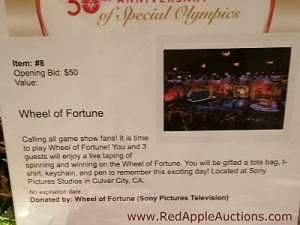 Hi Sherry – I’m interested in requesting a Wheel of Fortune donation but was wondering if they only give tickets to the show in California or if they offer tickets to other locations. I’m in New York near the city so hoping they offer tickets to a show when they travel here. To attend a local show would be convenient, wouldn’t it, Jennifer?! That said, I don’t know how much latitude they’ll grant you. My guess is that you get what you get; à la “beggars can’t be choosers.” But you can always ask and see what happens. Good luck! who do I contact to request for a donation from wheel? Laurie, the Wheel of Fortune contact information is listed in the blog post. That address was current at the time of the publication, but it’s always a good idea to do a quick web search to confirm that it’s still the best address. Good luck! Hi I work at a center for disabled adults and every year we hold a fund raiser Dinner Auction and we have a auction at this dinner . I am writing to see if you would be interested in a donation to be used at this event . You can visit our website at Chesterwye.com there you will see the many things we do and how your donation would help support the persons we support daily. Thank you in advance for your time taken to read this. Nancy, I’m guessing that you skimmed the post and assumed you could request Wheel of Fortune donations here. You can’t. You’ll want to contact the show directly. Good luck! We used that address in Dec 2018 and received a package for our February Auction. We were fortunate to have southwest airlines as a sponsor and were able to include 4 round Trip airfares with the Wheel package. ( We are located in Florida.) We got $1000 for the package. Thanks for the tip! That’s wonderful, Jan! Thanks for sharing the idea. Great information! Our auction is in a few weeks so too late for this years but maybe for next year. Are the tickets open to any date or do they send tickets for a specific date? Thanks for any info. I appreciate it! Kim, usually it’s open. I’ll pay more attention to the language used when I see the donation next and update this comment appropriately. Thank you so much!! I am excited to try and get this item and see how it goes…..will be good to have something a little different! I am seeking donations for the Bark for Life. A walk-a-thon that raises money for the American Cancer Society. This event honors our canine caregivers that help us so much during our cancer journey. Pamela, you need to read the blog and follow the directions if you’re hoping to get a donation from Wheel of Fortune.